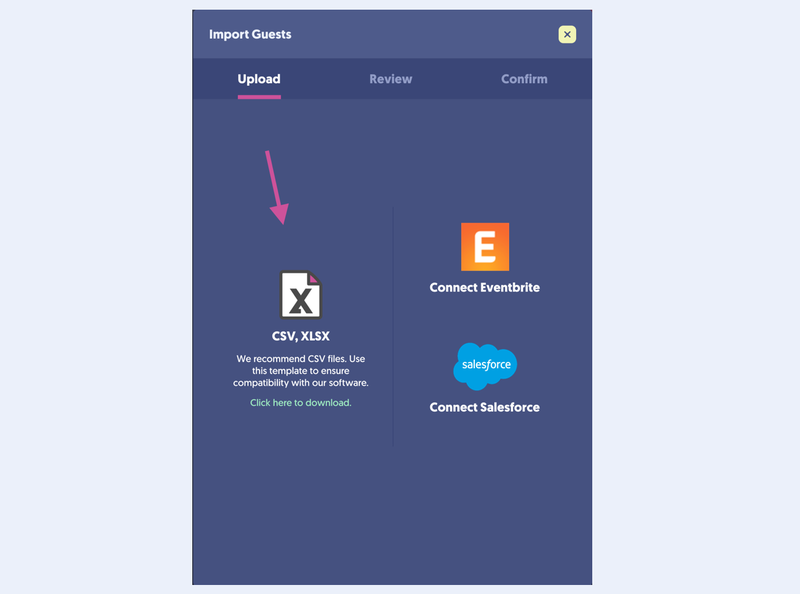 Quickly importing your guest list from an Excel spreadsheet into Social Tables Check-In is a simple, three-step process. To begin, open Check-In from within the event through File > Access in Check in Web on the top toolbar. 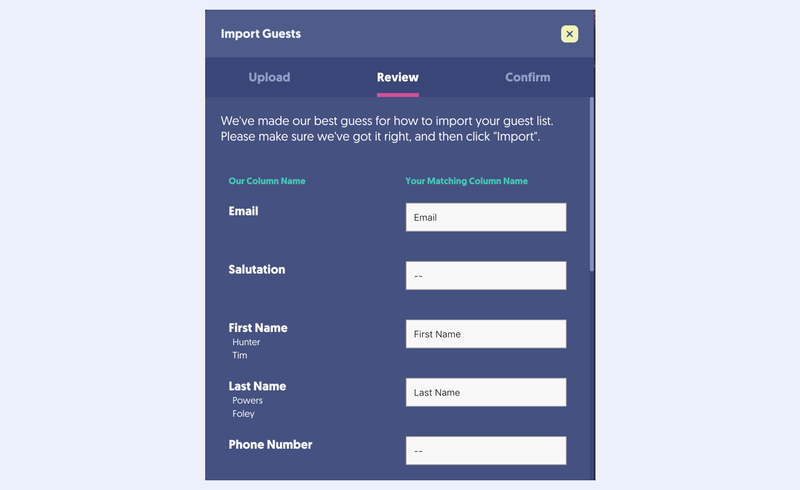 Eventbrite customers will want to read this article for the steps to import their guest list. 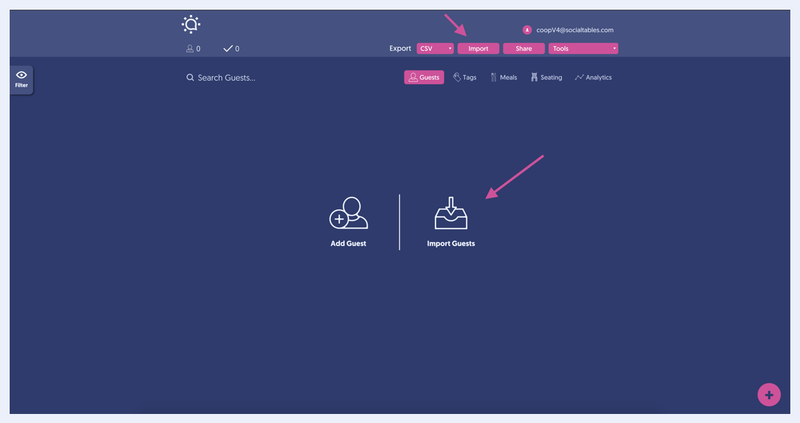 Select Import at the top of the screen, or if there aren't yet any guests in the Event, you can also select Import Guests right from the middle of the screen. Select the CSV, XLSX icon and choose the guest list file from your computer. Though each file format is compatible, we recommend using CSV file format. You'll also see a link to download our recommended template! If you have multiple meals and tags for a single guest be sure that you place a comma in between each meal in the cell. For example Veg, Thai. Remember special formatting is not recommended. Match the fields of your CSV guest list into the fields of Check-In. Our Column Names are listed on the left and Your Matching Column Names are listed on the right. We make our best guess at matching the columns up correctly (another reason to use the recommended template linked above), but you're free to make adjustments. If our default fields aren't enough, add up to 10 additional Custom Fields as well! After uploading the file and matching the fields, you'll receive a confirmation of a successful import. You'd also receive confirmation any type of error or discrepancy that occurred during the import, such as a duplicate guest or a formatting issue with the original spreadsheet. If you're experiencing any issues importing a guest list, contact Support using the button at the bottom of this Help Center. Or for immediate assistance, use our Live Chat! 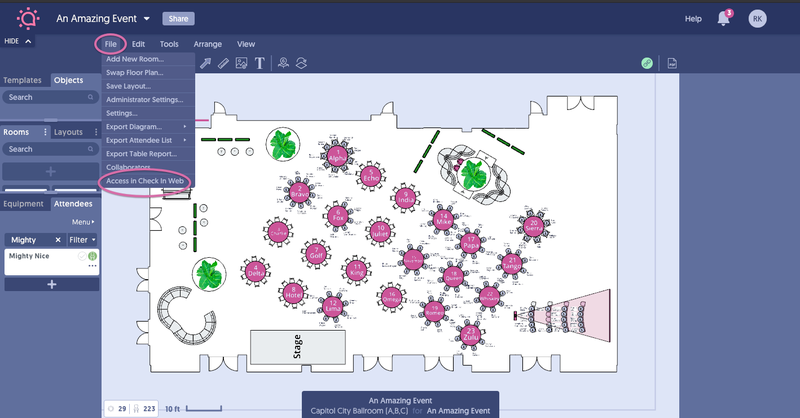 Need to import a guest list from Eventbrite? Read this article for a complete walkthrough.